[FINISHED] 40,000,000,000th Bet Giveaway! 40,000+ XLM Prize Pool! The 40,000,000,000th Bet Giveaway is Finished! We would like to congratulate our 144 Lucky Winners. This time we have given away 48,000 XLM (1.69 BTC) and 632 Days VIP! Thank you guys for staying with us tonight! It was really awesome Better luck next time for those who didn't win Have a great time on LG! Long time there was no any big giveaway! So let's rectify this! 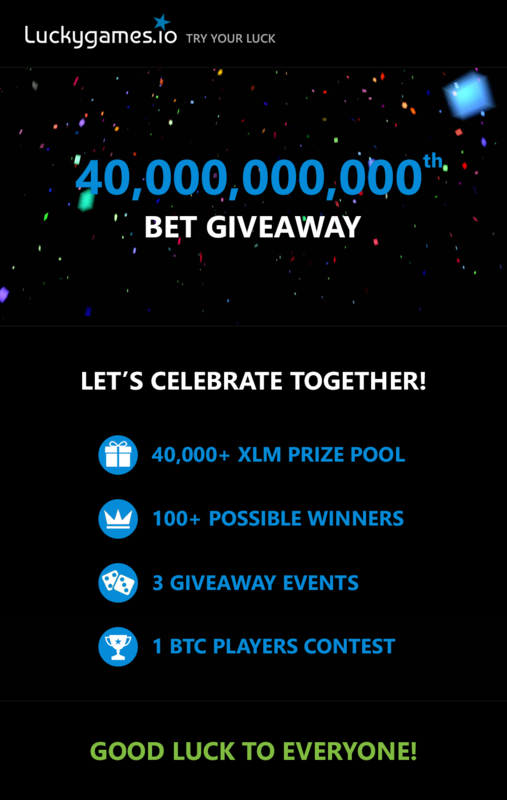 We are pleased to announce 40,000+ XLM Giveaway to the upcoming 40,000,000,000th Bet. This time there will be 4 events and more than 100 possible winners, so more chance to win! You need to hit the bet ids given below. Each winner takes 400 XLM and 5 Days VIP (Total 50 Winners). If you think there is a mistake, you can pm me at Luckygames p1AYER and provide the proofs. 40,000,600,003 - Multi-tabs / more than 1 session or JS bots are not allowed. 40,003,000,004 - Multi-tabs / more than 1 session or JS bots are not allowed. 40,003,100,003 - Multi-tabs / more than 1 session or JS bots are not allowed. Stellar Lumens (XLM) can be used only to place bets. Minimum bet amount - 0.01 XLM. You need to hack 38 out of 38 websites in the Hacker game as fast as you can. The first 50 winners will take 400 XLM and 5 Days VIP. The event will start after 40,010,000,000 bet, so watch out! Post your winning bet id in the comments bellow using this format. The bets made before 40,010,000,000 bet won't be taken. It's not allowed to start the game before 40,010,000,000 bet and finish it after. Minimum bet amount - 1 LUCKY. 40,000,000,000, 40,000,000,001 and 40,000,000,002 bets. If you hit 1 roll number, you win 200 XLM and 3 DAYS VIP! If you hit 2 roll numbers, you win 300 XLM and 5 DAYS VIP! If you hit 3 roll numbers, you win 400 XLM and 7 DAYS VIP! Players (Wagering) Contest with 1 BTC Prize Pool will be held on the next day since we hit the 40th billion bet. See the page Contests!